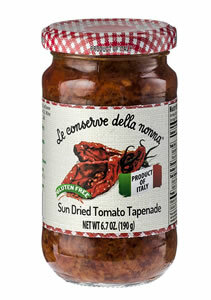 sun-dried tomatoes, seasoned with garlic and spices, sliced thinly and preserved in extra virgin olive oil. Sun-dried tomatoes 30%, sunflower oil, water, extra virgin olive oil, wine vinegar, sugar, basil, parsley, garlic. Gluten free.